Check out some of our client reviews about our services! 1. I wrote a review for this business a handful of years ago on a certain review site where there is a charge to access reviews...you know the one. But I'm just getting up and running with my Yelp account and thinking that, since I always read reviews before making decisions about who can come into my home (and definitely for those who will be caring for my beloved furbabies! ), I should probably pay it forward. Scott with Pets R Family Too has been taking care of our home and two cats during our absences since about 2010. It's strange to have a relationship with a person you allow into your home when you're not there, and yet Scott has earned that trust many times over. We've met him in person only twice, but he's a great communicator, always available when we need to schedule visits (and sometimes we're not as good about advance notice as I know we should be), and our cats, who are very skittish around new people, are comfortable with him (I know this because he's actually texted us photos of them when we're out of town to show how they're getting along). If you live in the PRFT service area, I would highly recommend interviewing Scott and seeing if he would be a good fit for your needs. 2. Very reliable, caring and knowledgeable. Your pets are in good hands for sure. 1. 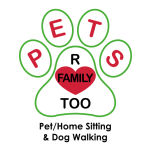 Pets R Family Too has been caring for our pets for over 5 years. We trust them and value their professional, efficient and caring service. I recommend them whole-heartedly.